For more than two years, Instinct Art Gallery has delivered on its ambition to present "socially relevant, thematic groups exhibitions that engage audiences." Its handsome white-walled space at 940 Nicollet Mall has been an oasis of chic, mostly Minnesota, art just a few doors south of Target's downtown emporium. Sadly, the gallery's next show, running January 23 through March 12, 2016, will be its last. The final exhibit is called "Unfiltered" and it will not mince words. Fittingly, it pairs the graphic art of British-born animal rights activist Sue Coe with the satirical feminist paintings by Minneapolis' own Nancy Robinson. The show coincides with the Twin Cities' month-long "takeover" by the Guerrilla Girls, a group of anonymous feminists who for the past 30 years have been criticizing art world sexism, racism and other injustices from behind gorilla masks. "The gallery has been successful in many ways," said director John Schuerman. "But the financial side of the equation just never came around to making sense." Schuerman's good taste and wide-ranging intellect defined Instinct's program from its start in September 2013. Working with a dozen or more artists, he organized thought-provoking exhibitions about which their work had something to say.Topics such as our "over-medicated culture" were provocative and highly topical. Other shows were more existential and poetic. "God's Sketchbook for Creation" featured paintings and sculptures of improbable critters like pink polar bears and mutant taxidermy projects that mashed bird heads onto animal bodies. Still other shows mused on the flow of time and how small we humans are under the vast sky above. Though the art was rarely, if ever, representational, nature was a recurrent theme. 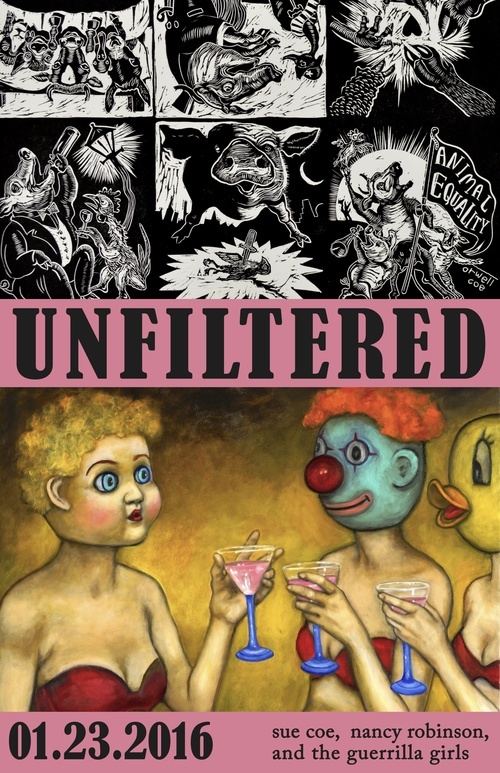 "Unfiltered" will pair Sue Coe's tough-minded excoriations of war, slaughterhouses and imperialism, with Robinson's wry paintings about the perils and disappointments of being a smart, sassy, mature beauty in a world full of self-absorbed, misogynistic dolts. Events: Opening reception, 6:00 p.m.- 8:00 p.m. Saturday, January 23, free. Instinct Art Gallery, 940 Nicollet Mall, Minneapolis. Show ends March 12, free. www.instinctmpls.com.